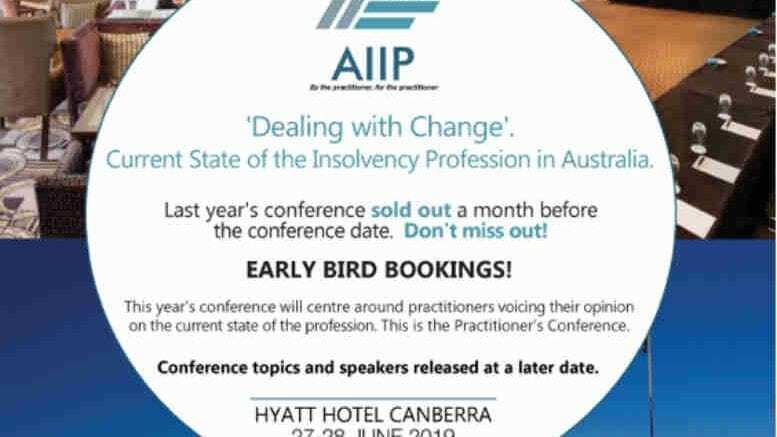 In June this year INO reported from the inaugural conference of the Association of Independent Insolvency Practitioners (AIIP), observing that the delegates gathered at Canberra’s Hyatt Hotel break seemed hungry for change. Perhaps that collective mindset was prophetic? When AIIP members gather in Canberra next time Winter rolls around the theme of the 2019 conference will be “Dealing with Change”. Be careful what you wish for? Either way, change is here and more is coming. Practitioners best be prepared. Industry funding six months after the first bill falls due in January 2019? Dealing with Change will canvass it, and by the way ASIC, where’s the metric? Changes to lending and credit flows in the wake of Royal Commissioner Kenneth Hayne’s final report in February? AIIP 2019 will explore the implications for the economy, for AIIP clients and for the profession. John Morgan, director of BCR Advisory and an AIIP co-founder, confirmed that the format successfully applied this year would continue in the final sitting week of parliament before the 2019 Winter break. “While the theme is going to be Dealing with Change, the format will be similar to last year, with panel discussions and individual presentations,” Morgan said. He also confirmed that among the topics to be canvassed in the panel discussions will be the banking Royal Commission. “Mainly it will be about how banks and credit providers respond and the implications for small and medium-sized enterprises,” he said. “Where will the insolvency profession sit as a result of all these changes and their consequences”? The Conference will include an economic update from one of Macquarie Bank’s experts and given the venue in the heart of the nation’s capital, potentially input from relevant legislators. INO will provide further details as organisers reveal more. Insolvency News Online illuminates the practice of insolvency Australia-wide, highlighting the triumphs and travails of the nation’s registered practitioners and the accounting and legal professionals who work with them. INO is produced by Peter Gosnell, former business editor and senior business reporter at The Daily Telegraph newspaper. During a decade-long career, your correspondent reported on such notable corporate collapses as HIH, One.Tel, Westpoint and Fincorp as well as some of the nation's highest profile bankruptcies and the investigations and prosecutions arising from Australia's most notorious instances of white-collar crime. Be the first to comment on "AIIP Conference to tackle climate of change"